SLOW members were out in force at last weekend’s urban race double in/near London. On Saturday, at the LOK-organised Hampstead Village Urban Race, SLOW dominated the open categories. Half of all entrants on Men’s Open were from the club, including 8 of the top 10. SLOW filled the podium places with Paul Couldridge, Rob Patterson and Michael Balling finishing 1st, 2nd and 3rd respectively. It was a similar story on Women’s Open, with more than half of entrants coming from SLOW, and a win for the club’s Jayne Sales, with Jo Reeve, also of SLOW, in second place. 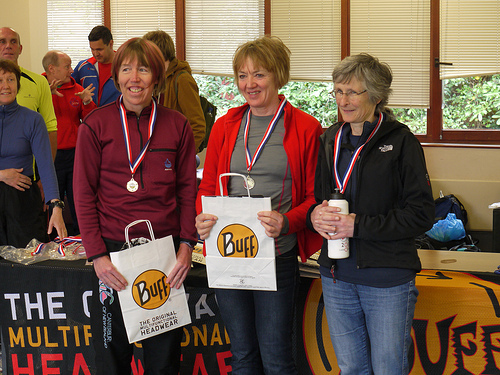 There was also a SLOW 1-2 (Sarah Brown and Diane Leakey) in the Women’s Supervets category. SLOW affiliate John Owens was third on Men’s Vets. 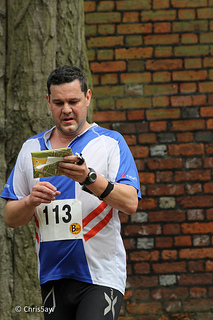 On Sunday the action moved to St Alban’s, for HH’s inaugural City Race. There were again plenty of SLOW members taking part. The best SLOW results were Diane Leakey’s (photo below, on the left) win on Women’s Supervets. Colin Dutkiewicz podiumed in 3rd place on Men’s Vets, Jayne Sales came 3rd on Women’s Open, and Frey Burger was 3rd on Women’s Young Juniors. SLOW affiliate Harold Wyber was 4th on Men’s Open, with SLOW’s James Lyne 7th on the same course. Christine Robinson was 4th on Women’s Supervets. SLOW’s own urban event, the London City Race, takes place this year on 22 September and entries are open now. Top photo, of Vince Roper (SLOW), by Chris5aw on Flickr. Bottom photo, of the Women’s Supervets podium, by Simon Errington on Flickr.